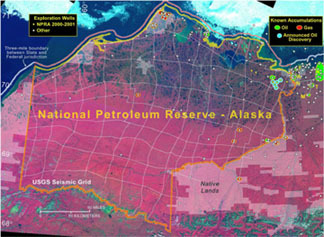 The National Petroleum Reserve in Alaska (NPRA) holds substantially greater oil resources than previous estimates, according to a U.S. Geological Survey (USGS) assessment released yesterday. The assessment comes just in time for the next scheduled leasing of NPRA land, June 3. It also follows on the heels of a heated energy debate this spring, when the Senate voted against opening the Arctic National Wildlife Refuge (ANWR) to oil drilling. The Bush administration has been looking to expand exploration of domestic petroleum resources, particularly on Alaska's North Slope. With the administration hoping to open an additional 9.4 million acres of the petroleum reserve to oil and gas leasing in 2004, the latest USGS results are sure to cause a stir on the Hill. In this first assessment of the area since 1980, USGS scientists report that between 5.9 and 13.2 billion barrels of oil are technically recoverable in the 22.5-million-acre federal lands of NPRA, with a mean value of 9.3 billion barrels -- more than four times the mean value of the previous estimate. For the entire NPRA, including state offshore areas and Native American lands, the mean estimate is 10.4 billion barrels. This map shows the locations of NPRA and ANWR on Alaska's North Slope, as well as the Trans-Alaska Pipeline System. See the USGS site for a higher resolution map. By comparison, a 1998 USGS assessment of oil and gas resources in ANWR estimated that between 4.3 and 11.8 billion barrels for oil are technically recoverable in the 1.5-million-acre federally owned lands (the so-called 1002 area). The mean value was 7.7 billion barrels. Most of the economically recoverable oil lies to the west of the Marsh Creek Anticline in the undeformed region closest to the areas of current oil development in Prudhoe Bay. According to the 2002 assessment for NPRA, an estimated 1.3 to 5.6 billion barrels of oil are economically recoverable in NPRA at market prices of $22 and $30 per barrel, respectively. In ANWR, however, in the same price range, those estimates jump to between 4.4 and 5.8 billion barrels, because ANWR covers a smaller area and contains larger accumulations -- making it easier to develop the area. At a market price of $35 or higher, however, the number of barrels of economically recoverable oil in NPRA and ANWR about equal one another. About 80 percent of the technically recoverable oil occurs in the northern third of NPRA. And the report estimates oil accumulations of moderate sizes, around 30 to 250 million barrels each, significantly smaller than those found in currently developed Prudhoe Bay and smaller on average than those in ANWR. The oil in the petroleum reserve lies in reservoirs only about 50 feet thick, stretched across an area 300 miles wide and 200 miles from the coast inland to the Brooks Range. In ANWR, the oil is largely concentrated in reservoirs as thick as 300 feet. Exploration wells previously drilled in NPRA and in adjacent state and federal waters showed that the area is geologically different from Prudhoe. The petroleum plays with the most potential are westward continuations of the geologic trends that host petroleum plays east of NPRA -- the Alpine, Fiord, Tarn, Meltwater and Nanuq oil pools. This Landsat image of Alaska's North Slope shows the NPRA and ANWR areas, outlined in yellow. Image from the USGS 2002 Petroleum Resource Assessment of NPRA. Data from industry wells from the Alpine oil discovery played a significant role in the revised estimates, says David Houseknecht, a USGS senior geologist and co-author of the 2002 assessment. "Even ARCO, when they drilled a discovery well, did not know that reservoir existed. In fact they were drilling to test a shallower prospect that was a failure, and they took the well on down, and there were three big surprises they didn't know about previously," Houseknecht explains. The formation contained beach-type sand with a separation of fine and coarse particles (winnowed) and a kind of stratigraphic trap previously unknown in that area. Additionally, the oil was high gravity, meaning that the oil flows easily. Previous data had shown clay-rich formations with fine-grained sands and lower gravity oil, like in Prudhoe Bay -- making the formation not viable as stand-alone accumulations. But the 2002 NPRA assessment shows otherwise. "The surprise in Alpine was that not only was there this beautiful well-winnowed shore face sand but it was full of oil that flows like water," Houseknecht says. This Landsat image map shows the locations of exploration wells and known accumulations in NPRA, along with the seismic grid used in the 2002 assessment. Read the USGS report for a more detailed map description. Geologically, the NPRA formations also differ greatly from those in ANWR, where the biggest resources estimated are in growth-fault rollover features that look similar to the Texas Gulf Coast, he adds. This latest USGS study did not incorporate 3-D seismic surveys or new wells drilled in NPRA since 1999. It does include estimates of natural gas for the NPRA area. Read the report online at the USGS site, where you can dowload high-resolution maps and figures. Also, don't miss a special energy and resources story in the June Geotimes about the recent congressional debate over ANWR.